Dropping in my local thrift shop last month, I came across a set of children's street safety signs. 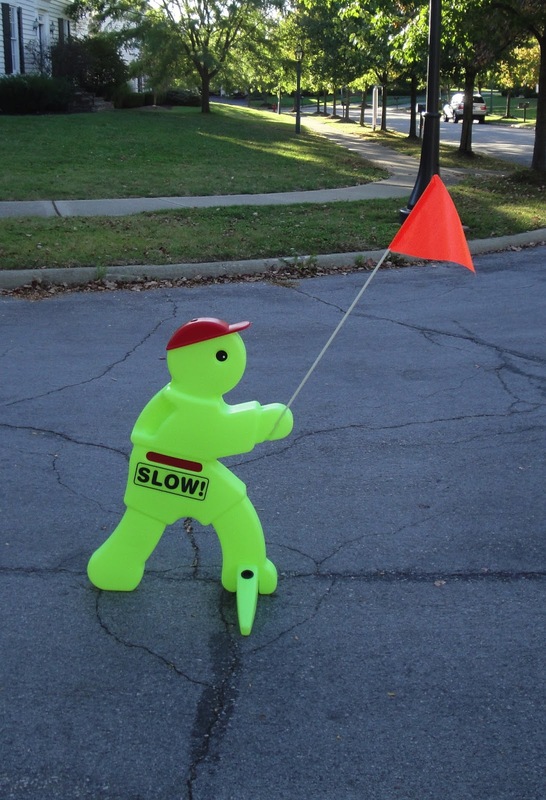 The three piece set consisted of a figure holding a bright flag, plus two folding “Slow” signs. All the signs were in excellent condition and the price couldn't be beat-$8 dollars for the complete set! But even though it sounded like a pretty good deal, I hesitated on buying them. As mentioned in previous blogs, I am really trying to be careful about what I bring home, especially large stuff that takes up space in my garage. After looking over the signs, I walked around the store completely distracted, while debating in my head whether to buy them or not? The big question being-could I sell this set quickly? That’s when it hit me...why not post them on my Facebook yard sale group before I even paid for them? In other words, post them right then and there and continue shopping. I could kill a little time browsing, while waiting to see if any buyers would bite on the listing. Admittedly, the whole idea was a little risky. There was always the chance another store customer could have bought them while I was browsing, but I thought it was worth a shot. Not wanting to attract any attention by taking photos of the actual set, I found a few Google images of the signs and used it to post the set on my local FB yard sale group. I then priced the set at $30 dollars. After posting, I continued to browse around the thrift shop. After about ten minutes, I checked my phone again. Sure enough, a buyer jumped in and said they were interested! With that, my question on whether the signs would sell was answered. I put my phone back in my pocket and walked the signs up to the sales counter to pay for them. Later that day, the buyer came by MoneyintheGarage headquarters and forked over $30 bucks for the set. My great sales experiment had paid off..selling something that I didn’t actually own when I posted it. A risky sales technique, but one that I can’t wait to try it again! Ummm, what’s going on here? Getting back to more normal flips, I've had some nice little money makers recently. While all my flips give me a warm feeling inside, I particularly like low cost “smalls" that turn into “big" profits. Who wouldn’t, right? For example, not long ago I came across this vintage tumbler with what appears to be a gag cartoon printed on the side. The vintage logo and bright graphics caught caught my eye, not to mention the the bawdy depiction of two flying geese. I am guessing it was originally some sort of funny “gag" item you might find in a Spencer gift store? Whatever the intention, I looked it up on eBay and discovered an identical glass brought in decent money. Since Goodwill was only asking 99 cents for the glass, I really had nothing to lose. Turns out, I was spot on! A week later, I sold the tumbler for $35 dollars on eBay! Crazy, right? Naturally, I now look for this tumbler every time I walk into a thrift shop! Hopefully I’ll find a few more in the future. I’ve started to check my current inventory for football items to post. For example, one of the best sales I recently made was this huge Gemmy inflatable football player. I acquired him last spring at a yard sale for ten dollars and nearly forget about him. He was new/old stock and still sealed in his plastic bag. 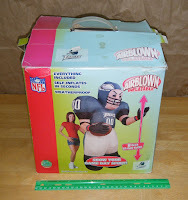 After buying him, I tossed the box in the corner of my garage with plans to sell him during football season. I actually forgot about him, but re-discovered the box when I was straightening up the garage. I immediately put him up on on eBay. These large inflatables demand big bucks on eBay and my guy was no exception. I sold him for a “Buy It Now” price of $150 dollars! You may wonder why I did so well with him? 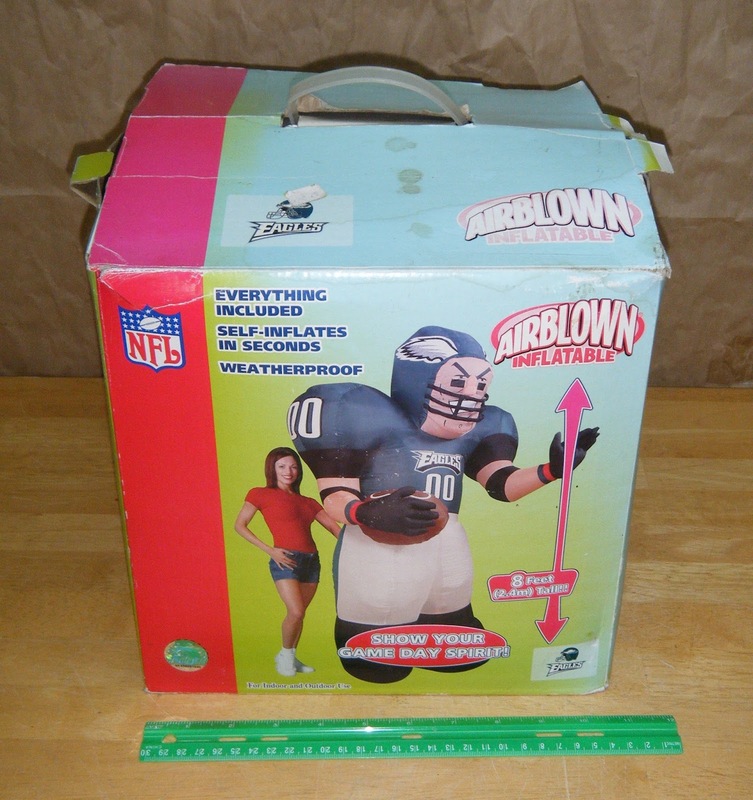 Two reasons: he was new in the box, and at eight foot high, one of the tallest inflatables available. With sales like that, I continue to be a big fan of yard inflatables. While there's always a risk of getting stuck with a leaky inflatable, I feel it’s worth taking the chance due to the money you can potentially make. In fact, I have a few Halloween inflatables that will be going up on eBay in a few months. I’ll be sure to post about those sales come Halloween time.